Our Diabetic Life: Anatomy of a high. He walked into the room, his face ashen white. My mind began to race, tracing our history for the last few hours. We had taken a three hour tour of the coastal shores. L had peed three times in that amount of time, and sipped contentedly on two water bottles from the cooler. We dined on sandwiches while watching the magnificent sunset, but since he was high and feeling it, L decided to pass on them until he came down. Except he hasn't come down. Though these days are few and far between, we both knew the sick day protocol and sprung silently into our collective roles. He changed into his pajamas and grabbed a bowl and a large water bottle from the cupboards. I grabbed a big soft blanket and arranged the ketone strips and One touch strips within reach. He lay next to me as the miserableness began to slowly creep into his stomach. "Mom, I'm going to throw up." I rubbed his back until the feeling passed. He sipped purposely on his water and I rechecked his blood sugar, noting the sorry state of his fingertips. "Sorry babe, we have to pull it." As I peeled back the infusion set I find the culprit of our woes, the cannula is bent in half. I changed this set at 2:30. 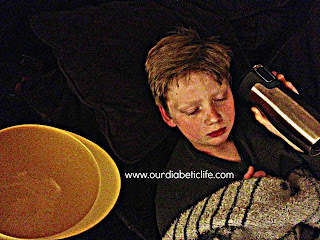 It was now 9:00, and he has been without insulin for a full 6 and a half hours. I smile at L and walk casually to the cupboard, deliberately trying not to scare him. I can't remember the last shot I had to give him by syringe. He isn't going to be happy. As I explain to him what must be done, a set change and a shot of insulin, I see firsthand where the saying, 'stiff upper lip' comes from. He closes his large round eyes, lifts his chin and wills his bravery to take over. I slip the needle smoothly into his arm and he says, "Tell me when you do it." I had already done it. Win. And then he throws up. At this point the fear begins to creep up my back, but I wink at him telling him the worst is over. I take the bowl away to clean it up and in an instant I'm taken to that dark place. The place where worry reigns and your body is paralyzed from the thoughts of what could be. The hospital? No. I will not take him there unless I must. Taking him there would mean I give up all control. I shake those thoughts away...don't get ahead of yourself, Meri. We aren't anywhere near there yet. A recheck shows we are in the 400's. Ketones are descending...we are going in the right direction. The light of hopefulness fuels me to keep up the work. Insulin. Fluids. Insulin. Fluids. It took four hours, but I got him down to 140 with .4 ketones. It was 1 am when I allowed myself a nap. The alarm relentlessly gawked an hour and a half later, until I succumbed to its cry. 48 with 0.4 ketones. I took a deep cleansing sigh, grateful I passed on the sleeping pill tonight. I've slept through too many alarms as of late, I knew tonight was too important. Apple juice, apple juice. Deep down I knew the apple juice would bring him up, and not keep him up. I've always known it. But I talk myself into thinking it will be fine. Hundreds of families treat with apple juice only...and look! An hour later he is 136! I will set my alarm for another hour and see what happens. But as happens when you are deliriously exhausted, and don't have a husband to nudge you out of bed...I somehow slumbered through my gawking alarm. Vivid dreams took over. Fear can try to keep me up all night, but faith that everything will be ok makes one fine pillow. I was carried away in the happiness of my dreamy state and didn't wake up until 6am. Where he was found to be 56 with 1.7 ketones. He opened his eyes and smiled wryly at me. "How many times did you check me last night?" "Just a couple times my sweetness." He pulled his legs under himself and swung his arms lovingly around my shoulders, causing me to almost lose my balance on the edge of the bunk bed. "I'm so lucky to have an angel mom. Thank you for taking care of me." As I breathed in his genuine expression of love and thankfulness, all the worry from last night melted into adoration. "You're staying home with me today, handsome. You are the king of the castle. Name any breakfast and it's yours." And as he poured his own cereal with his hands still dimpled from the last breaths of babydom, I witnessed true love in action. We faced our fear last night. Though it seems facing fears has become part of our normal these days. I won't allow the fear to turn our life into one of self pity...in fact I vow to use it to make us stronger. There is a quote, "Courage is not the absence of fear, but the mastery of it." That is our quest. To master our fears and conquer each one. One at a time. One day at a time. Though when ketones are present...one minute at a time. I love and hate this Meri. I love how well you describe a night like this. We’ve so far only had one, and it wasn’t quite this bad. We still have some functioning beta cells keeping the worst away – but I know this is my future. I too have issues with the night checks. I set alarms at 12 and 2, and then somehow the next time I open my eyes it’s 6am! I have no idea how to fix this issue as there just isn’t time for more sleep in my life. Anyway, I love your blog and it always makes me feel a bit less alone. So sorry about the glucoaster ride he experienced, Meri. I hate going that High, and being at the point of vomiting, but it's ironic how much better I feel once that happens and I get a little bit of that sugar and Highness out of my system. Anyhow, glad it all balanced out and you were able to face those fears together. An angel mom - indeed. Breaks my heart that he had to go through this. Hang in there, Angel Mom, and try to catch a nap if you can. The laundry & housework & whatever else can wait. Hate those roller coasters with gallons of juice or water! You've got some awesome sons, but how could they be otherwise with such resilient parents? beautifully written, and I know it's straight from the heart. You're a woman of impeccable courage and strength.. and admired by so many! God bless you and keep each of you. I don't know how you do it, tear at the heart string as often as you do! What a lovely heart-warming story. We all need moms like you! I always have to remind myself to breathe when I'm reading some of your posts. Pat on the back - oh heck - BIG hug for hanging in there and most importantly, staying calm. Sharing courage is difficult and you did it. I've been sleeping through alarms lately... Husbands don't always help with that :/ I'm glad he stayed home with you the next day. A day with the mama = love! Oh, how I hate kinked cannulas. I've had way more than my fair share. And I am with Mike about the 'feels so much better once you vomit' bit. I'm sorry you had this experience. But so glad he has you. oh, what a sweet boy you have - after a rough night that's exactly the reaction you needed. We had a horrid night the first night of vacation, what is it with vacation?! The weird part was Isaac threw up straight for 3 hours, I pushed sipping on clear G2 and snuck glucose tabs in whenever I could but then BAM he was done. At 3am BG went steady and stayed, ketones blasted down and Isaac announced he was starving. In my short 7 years of parenting I've never seen an illness like that - but I am thankful it was over and done with quickly as I had no idea how taking your child with t1d to a clinic in another country would go over. I am thankful we skipped that part, but we were so close.